Cal Newport, the author of Digital Minimalism and Deep Work, talks with Jeff about the problem we all face – distraction. Our job as sales professionals is to work hard, using our brains to solve the problems of our customers. However, when we’re distracted by our phones, social media and so many other digital attention grabbers, our ability to focus is severely compromised. Cal and Jeff talk about the importance of having focus time and the benefits for you and your customer. I started blogging here at calnewport.com soon after the publication of my second book, and have been posting here regularly ever since. I famously, however, have never had a social media account (it turns out that this is allowed). Announcer: Welcome to “The Buyer’s Mind” where we take a closer look deep inside your customer’s decision making mechanism, to reverse engineer the perfect sales presentation. Now, please welcome your host, Jeff Shore. 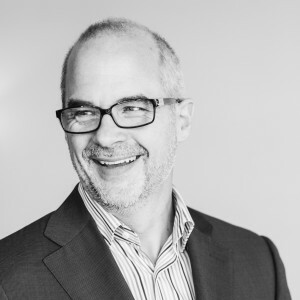 Jeff: Welcome everyone, once again, to “The Buyer’s Mind.” I’m Jeff Shore, your host here, the podcast where we really want to understand the way that our buyers think. And today we’re going to take a very special journey. We’re going to look at how we can be better in the work that we do in order to better serve our customers. And we’ve got a very special guest on that I personally sought out because I was so impressed by the work that he had done and I think you’re going to love this show. As we look in and we dive into the topic about how to work as effectively as we can, and we’re going to look at things like focus and deep work versus shallow work. We’ll get into that as we go through, joined as always by my show producer, Paul Murphy. Hey Murph, let me just ask you, is it difficult at times to focus on doing your very best work? Paul: There are so many distractions, right? I mean, my wife will text me in the middle of the day and ask a question about, you know, finances or something or, you know, my phone blings, and, oh, there’s a Facebook post, or there’s so many things that just vie for my attention that even in the middle of doing something that I’m supposed to be focusing on, easy to get distracted. Jeff: But do you do you think that that’s just a normal thing, or do you consider yourself to be an easily distracted person? Paul: I can be ADD all on my own, no one has to help me, but I think to a certain extent, yeah. I mean, I can get into a zone where when I’m working, I am completely focused and feel like I’m there. And then it just takes a little pebble like a text just to kick me out of the zone. And that’s no good. Jeff: Right. Yeah. Yeah. That was this week, I was speaking at our conference, at our sales leadership roundtable meeting in Southern California. We were at the Balboa Bay Resort. And right outside the Balboa Resort, or adjacent to resort is the Balboa Bay Yacht Club. And this is where the yachts hang out that all the other yachts are impressed by, right? So I’m sitting there during the session and I’m looking out, it catches my eyes, I look out, there’s a yacht out in the harbor. It’s docked right there next to the meeting room. I mean, you could have thrown a rock and hit it, I would have paid heavily for that, but I could have. But there’s a yacht called the Serengeti. Most people are not familiar with the Serengeti, but if you look it up, you will see that the yacht was once owned by Johnny Carson. So I’m in the meeting and I’m talking to people, and then somebody shares an opinion or they’re talking about something, and I don’t know what made me just cause a quick glance, somebody walked by, whatever it was, but I looked out the window and I said, “Oh, there’s the Serengeti that was owned by Johnny Carson.” I used to stay up late a lot watching Johnny Carson and I remember when Ed McMahon was not there, Doc Severinsen would fill in as the host and Tommy Newsom would lead the band. And meaningless, completely meaningless train of thought that got me absolutely nowhere. And in the meantime, somebody was talking, somebody was talking. So yeah, I would say I don’t know if I’m abnormal or not, but distraction is just a huge, huge issue and it just doesn’t take that much. Murph, do you try and put any systems to try and help you deal with that? Paul: I have been trying to put some systems into place to make sure that my phone is not near me. You know, some other things to make sure that I put signs up on the door to say, “Do Not Disturb.” So kids don’t walk in and start chatting with me about this, that, and the other thing. And so, you know, those things that I put into place to help make my workspace a quiet focused area are truly important. Jeff: There is no question about that and I have been doing much the same work largely because I read the book “Deep Work” by Cal Newport. Cal Newport is our guest on the show today and I’m just going to suggest that you do a couple of things. One, pay close attention, two, take some notes, listen for those action items, but then be planning on having a conversation with somebody about what you hear on today’s show. Today’s show is really, really powerful. The book is amazing. I highly recommend that you get it. So without further delay, our interview with Cal Newport. Well, you know, one of the great things about hosting a podcast is that you get to go out and find the guests that you really want to have on the show and I read recently a book that has just rocked my world. It’s called “Deep Work” by Cal Newport and just a fantastic book about rules for focused success in a distracted world, and when it comes to the distracted centers, I am the chief among all to paraphrase the prophet. I look at this and I needed this book, I really do, and it has helped me tremendously and so we reached out to Cal Newport. Cal Newport is the author of several books including “Deep Work,” “So Good They Can’t Ignore You,” a number of books for students, and a new book coming out called “Digital Minimalism.” I cannot wait to read it. He is matriculated from Dartmouth College. He got his PhD in Electrical Engineering and Computer Science at MIT. So the academic pedigree is definitely there. Hired on as the Assistant Professor of Computer Science at Georgetown University. Got himself tenured, now the Provost Distinguished Professor of Computer Science. A prolific blogger for more than 10 years, but here’s something that’s going to blow your mind. He has never had a social media account. I thought that that was against the law. So we’ll have to figure that one out. Joining us from Takoma Park, Maryland, Cal Newport. Cal, thanks for being on the show. Cal: Hi Jeff. Thanks for having me. Jeff: I’m really, really excited. And this really is a book that has changed my thinking, changed my focus, and I want to get into “Deep Work” and then you can tell us about “Digital Minimalism.” But let’s start with “Deep Work” and take us back to the journey even before the book was written because you tended to look at it and say, “the life of a college professor is one that is on the one hand cool, and the other hand, frustrating because you’re going to log a lot of hours and you see a lot of people who are just burned out.” My son-in-law is a college professor at University of California Davis. I see how hard he works and you looked at it and you said, “I understand hard work, but I also understand having a life.” And so there is a whole…a life study that went into this book before the book actually got written. I don’t want to steal your thunder, but did I capture that correctly? Cal: Yeah, I think that’s a fair setup for how “Deep Work” came about. My books tend to bridge, so I’ll finish a book, and there’ll be something left dangling that will lead me into a whole other direction. And so what happened here is I’d written this book back in 2012 called “So Good They Can’t Ignore You,” which was actually about career advice, try to understand what’s true, what’s not true. And one of the big findings from that book is that one of the most consistent ways to build a career that you’re very passionate about is to get very good at things that are unambiguously valuable. So the natural follow-up question to that was, okay, how do you get very good at things that are unambiguously valuable? If this is the magic elixir to passionate satisfaction of your career, how do you do that, if, for example, like I was your young professor? How do you do really well there? How do you stand out? How do you become so good you can’t be ignored? And as I looked into this, it became clear that the total number of hours you work or how busy you are, are imprecise metrics. What seems to be true in many different knowledge sector fields is that the effort that matters is what I call “Deep Work”, which is intense unbroken concentration in which you’re using your brain to create new value. That this is the core activity and yet we’ve gotten away from this realization and putting together our work cultures, building our offices, planting how our organizations actually flow, that we’re undervaluing the power of uninterrupted concentration. Jeff: It seems to me, though, that you’re immediately flying in the face of the way many organizations are set up to look at it and say, yeah…I mean, to paraphrase what you just said, don’t confuse effort with effectiveness and yet over and over again, we live in a time and effort economy. If you’re putting in the time and I can see you always busily at work, well, then you must be doing what we want you to do. But this sort of flies in the face of your premise. Cal: Yeah, I think we got it wrong. We can imagine two different timelines as we enter knowledge work in the digital age. You know, one timeline would be stepping back and saying, “What is the primary resource that we have at a knowledge work organization?” And the answer, the right answer in my opinion is we have these brains that through concentration can take information and produce new value. So in this alternative universe, we might have said, “Okay, how do we build an organization that best protects and promotes the ability of these brains, our core resource, to think hard and produce value?” What we did instead is we doubled down on this communication privacy hypothesis that said the key to unlocking productivity in the digital world is fast and flexible communication. And we invested billions and billions of dollars in the software and infrastructure to try to make communication faster, and to increase the settings in which we can actually send and receive communication. We doubled down majorly on this idea of, if we could just make communication faster, if we could just make it more flexible, that we’re going to unlock this productivity nirvana. And that was the absolute wrong bet. And so I think we put everybody out on the wrong horse. And what we’re actually starting to realize now is that in the knowledge sector that we’re facing a productivity crisis. We see it at the economic metrics, non-industry productivity has stagnated throughout the whole period where we invested all of these tens of billion dollars in the communication. We see it in the anecdotal reports, people are burned out. They’re waking up early and staying up late just checking messages. They’re barely getting any actual value-producing work done. We know that we have a problem and so I think we got it wrong. We focused on communication where we should have been focusing on concentration. Jeff: So true this up, because in the book, “Deep Work,” you say that there are two core abilities for thriving in the new economy: the ability to quickly master hard things and the ability to produce at an elite level in terms of both quality and speed. So now you’re just saying right here that this idea of let’s speed up all of our communication in an effort to be more productive is not working. And yet you are saying that the ability to produce at an elite level in terms of both quality and speed is core to our ability to thrive. So what you’re saying is we have, in fact, increased speed, but speed in the wrong things. Cal: Right. If you want to produce at an elite level or if you want to master hard things quickly, it’s very clear from the research that the activity that’s going to best support those goals is intense concentration. The better you are at concentrating, the higher levels of intensity that you’re able to achieve. And the more time you spend doing it, the more successful you will be with those goals. What we thought instead was, well, maybe if we make communication faster and more flexible, we’ll be better at those things. But it turns out that doesn’t work out, and what’s really going on, I mean, I think why we’re seeing this conflict between communication and concentration is that if you set up a culture like we have where unstructured, ongoing, fast and flexible communication is just the substrate of which we build our business lives, this requires you to constantly tend these conversations. So you have to keep checking the inbox, you have to keep checking the Slack channel. Now, the problem with that is that this requires lots of context shifting. You’re working on the hard thing but you temporarily look at the inbox. You’re back to the hard thing, now you’re glancing at the Slack channel. But we know from the last 10 to 15 years of psychology research on this topic is that that context switching is really harmful for your ability to concentrate, so it really reduces your brain’s ability to produce value. And so what we’ve unintentionally done is introduce technology into our workplace that makes us much worse at the exact activity that actually produces the value that funds our workplaces. And I think it’s that mismatch that’s created this productivity crisis. Jeff: Let’s talk a little bit about why that happens, because you talk in the book, and I think at this point, the idea that multitasking is sort of a crock that was handed to us has been debunked sufficiently. But you take it to a different level and talking about the danger of what you refer to as attentional residue. And as soon as I saw that in the book, it was one of those moments that had caused me to set the book down for a little bit and look up into the right and ponder here how often this is the case. Can you explain attentional residue and why it might seem harmless to take a quick glance at your inbox every few minutes, but in reality, you’re really doing a lot of damage. Cal: The early 2000s, late 90s, we figured out, as you mentioned, that peer multitasking didn’t make any sense, right? So this idea that you could have a Microsoft Word window and an email inbox open while you’re on the phone, you weren’t really doing all three of these things. You’re trying to switch back and forth between them and you’re doing them all pretty poorly. And so we got that message, multitasking is bad, single tasking is good. And so we thought that we were shifting to single tasking because we only had one thing open, we were only doing one thing at a time. But what we preserved, as you mentioned were these quick checks where it’s I’m mainly writing this hard marketing memo, but every 10 or 15 minutes, I need to quickly bounce over to the Gmail tab just to make sure there’s not some important piece of communication or I have to glance quickly at my phone. And so we thought we were single tasking because we weren’t actually doing multiple things concurrently, we were just quickly checking things every once in a while. But research coming out of the psychology fields in particular started to show that those quick context switches were having a really negative impact, it was similar to what you might have from actual multitasking. So attention residue was a term that was coined by Sophie Leroy, who’s a professor in organizational management who has a background training in psychology. And what she discovered in her experiments is that if you’re focused on a hard task, let’s call that task A, and then you temporarily switch your attention to some other tasks like your email inbox, we’ll call that task B. When you come back to task A, that switch is going to leave a residue in your brain that reduces your cognitive performance. And in fact, it could take awhile for that residue to clear. So for awhile, you’re operating at reduced cognitive capacity. So what happens is, is when you check your inbox every 10 or 15 minutes, the fact that you’re checking it really quickly doesn’t really matter. It’s the context switches that hurt you. And if you’re doing it every 10 or 15 minutes, you never give yourself a chance to actually leave that state of attention residue. And so most knowledge workers who think they’re doing the right thing are unintentionally putting themselves into a self-imposed state of cognitive impediment. It’s like they’re taking a reverse neurotropic drug that makes them worse at the actual activity for which they’re being paid. Jeff: And yet culturally, that’s just what we have come to expect, right? We’re at that point where we look at it, we say, “Well, if I got an email, I have to answer it right away.” And I think we…well, somebody once put it this way to me, we teach people the way to treat us and I wonder if we haven’t…if this just isn’t self-perpetuating after a while, very, very dangerous. So what does it mean then to work deeply? If you just looked at it and said…because you have a series of rules in the book, and your first rule is to work deeply. How would you define that in a neat little package? Cal: So to do deep work means that you are spending a long unbroken amount of time with no distractions, just focusing on one cognitively demanding thing. And so for a session to count as deep, it has to last for a while, and there could be zero distractions, so no quick checks, no context shifting. You clear out the attention residue so that your brain could operate at 100% capacity, and you keep it focused on one cognitively demanding task. And so when I say my first rule is to work deeply, the details of that is to actually try to set up your workflow and your work day so that you regularly have deep work sessions that are scheduled and protected and surrounded by rituals that make you more likely to succeed with them. I don’t want people just trying to ad hoc, at an ad hoc fashion, stumble into deep work. If you wait until you feel like you have nothing to do, and you’re really in the mood to focus, you’re never going to get any deep work done. You actually have to very aggressively try to pry this into your schedule. Jeff: What do you do if you are in a very responsive job? There are many people, for example, who are listening to this podcast who are in the field of sales. And, you know, they might be in an environment where a customer could walk in at any time. Is it possible to still do deep work knowing that you could be distracted? Because it seems to me that even the knowledge that I could get distracted is going to create some attentional misfocus. Cal: Well, I think that’s true. I mean, I think if you are open for business in the sense that someone could come and distract you and it’s likely, that itself is probably going to diminish the deep work to some degree, which is, you know, why I think it’s important that for whatever your particular job is, you figure out what makes sense for that position. And one of the strategies I recommend that I have a lot of feedback now from readers that is working quite well is that you have a conversation with whoever you report to. And if you’re self-employed, you could have this conversation with yourself where you try to answer the question of, what is the ideal deep to shallow work ratio for my position and the way I bring value to this organization? In a typical week, what fraction of my hours should be deep work versus non deep work? And this is an actual non-trivial discussion and the answer is going to really depend based on what you do and what your organization needs. But the key is to have clarity with whoever oversees you what makes sense and you’re coming at this from a positive perspective. It’s not, “Hey Boss, I hate how you distract me, stop bothering me on email.” That doesn’t go well. Okay? That’s not going to make any changes. But if you say, “I want to optimize the value I produce for you, here’s what deep work is, here’s what shallow work is, both is important. What’s the ratio that’s going to get the maximum return for you on your investment in me? Once everyone’s bought in on a particular number, that really makes it much easier to try to engineer addendums, habits or rituals into your company’s workflow that allows you to actually hit those numbers in a way that everyone has buy-in into. And so that’s what I often recommend, is get a number. Here is the number that we think is going to help me produce the most value and then you work backwards and say, “What changes would we have to make?” Like maybe the change is, you know, before 10 a.m., I’m supposed to be deep working at home, you don’t expect to hear from me. Or maybe it’s, “There’s this two-hour chunk in every afternoon that the team agrees that this is time that I’m not to be disturbed,” whatever it is. Until you have a positively constructed number, it’s very hard to actually enforce any sort of sustainable changes to work cultures. Jeff: Is there a minimum amount of time that one needs in order to work deeply? Cal: Sixty to 90 minutes is typically what I suggest. Jeff: Okay. All right. You have another interesting rule in the book. And I’m guessing that when you share this rule in front of an audience, you get that sort of quizzical, you know, puppy dog look, because the rule is embrace boredom. And that just seems so countercultural. When I first looked at it, I recognize I do not do boredom well at all. I try to avoid it. And yet, what I find here is that if I’m standing in line at an airport waiting to board a plane, which is a place where you’ll frequently find me, there’s always something that has my attention and it’s usually my smartphone. You take a big whack at smartphones. In fact, you wrote a blog post recently entitled that, “Are We Beyond the Age of Smartphones?” Talk a little bit about embracing boredom and the benefits of embracing boredom. Cal: The big idea of that rule is that concentration is a skill that you have to practice to get good at. Many people get this wrong. They think concentration is a habit like flossing their teeth, something that they know how to do, is just about doing it more often. But that’s not actually the case. Concentration is a skill more like playing the guitar, something that if you’re not practicing, you’re not going to be very good at. And so you actually have to systematically improve your ability to focus if you’re going to get the real superhero style returns that serious deep workers get by prioritizing focus. So how do you train your ability to concentrate? There’s a lot of things that matter. But one of the simplest things you can do, and this is where the title of that rule comes from, is to regularly inject boredom into your life. By boredom, I mean you’re there, you have no novel stimuli, you’re just okay without it. You stand in line and you just people-watch and that’s it, right? The reason why I suggest that is that if you have taught your brain that at the slightest hit of boredom, it gets novel stimuli from your phone or from your web browser, it’s going to build a Pavlovian connection between boredom and stimuli. It’s going to demand, if I’m a little bit bored, give me stimuli. If I’m a little bit bored, give me stimuli. The problem from a professional perspective is that when it comes time to concentrate on something hard, something that’s going to produce a lot of value for you or your organization, your brain is going to think this is boring, because in the technical sense, there’s not a lot of novel stimuli when you’re focusing on one thing. And if it’s been taught, it always gets a shiny treat at the slightest hint of boredom, it’s not going to tolerate deep work and it’s not going to go into the states of concentration that really moves the needle because you’ve taught it the dinner bell rings, you get the food, right? And so if you’re connected to your smartphone every second outside of your office, when you get into your office and want to really lock in on the thing that matters, your brain’s not going to allow you. Jeff: It’s interesting, though, that you will find for a lot of people and I’m certainly subject to this is that there’s almost, at times, an addictive property to insignificant things. So I could look at it and say, you know, I can or I remember years and years ago when the game Angry Birds came out, well, for some…or actually even before that, I’ll go back to Tetris. I’m going to date myself now. I mean, I would play Tetris so much that I would lie down in bed and I would see the different shapes fall into place while I moved them around. It seems like there was a form of deep work there but to exactly the wrong thing. So am I wrong on that? Cal: Well, I mean, this is a topic and I get into more detail in my new book but there’s a lot of engineered addictiveness in a lot of these stimuli experiences that you encounter on your phone, which is why you want to be really wary. You know, if you’re constantly bored and busting with your phone, it’s not just that you are losing the professional advantage of having a brain that’s comfortable with concentration. You’re also exposing your brain quite probably to services and apps that have been engineered very carefully to foster compulsive use. And if you’re someone who makes a living with your brain, for example, you want to be really careful with that just like if you are an athlete who made a living based off of your body, you’d be very careful about addictive substances like cigarettes or junk food that could really deteriorate your performance. And so we need to take our brains more seriously and we need to be more wary about the damage that what’s coming to these screens can do to them. Cal: I think this is definitely true. And in fact, I would even correct this statement a little bit that instead of saying, what’s compelling about social media is that it gives you constant stream of information about people you know. Actually, the way they’ve engineered these tools is much more insidious, what makes social media irresistible is that they have configured them to be a constant stream of information for people you know about you. That’s what they really honed in around the time that they moved to mobile to get people to start compulsively using these apps way more than they were before is that they turned them into these streams of social approval indicators, likes and hearts and retweets and photo auto tags that arrive in this app with intermittent reinforcement which makes it almost impossible not the check. And they know exactly what they’re doing. I mean, they studied this psychology literature. They needed you to have 10X more engagment with this app so that they could get their investors returned when they did IPO. So these things are engineered to be compulsive, but there’s two elements here. There’s the impact in your personal life. There’s the impact in your professional life. The personal life, I get into more in “Digital Minimalism.” In “Deep Work,” I come at it from the professional perspective and quit social media is a title for a broader concept, which is if you make a living using your brain, you’re a skilled practitioner, like any other skilled practitioner through history, you should be very selective about your tools. Don’t just sign up for something because you could come up with some benefit that might sometime give you or your business, you would never buy a piece of garden equipment from Home Depot with that mindset like, hey, maybe this thing will be useful in my yard at some point, let me buy it. If you were a farmer, you would never invest in some complex piece of machinery without really knowing why this was really worth the investment. So all I’m saying is when it comes to digital network tools in the professional sphere, you need to have the same selectivity. It’s very naive and we would never do this in any other skilled profession to just say, hey, if there’s some benefit, why not? Because there’s huge cost to these things. So you have to do a very careful cost-benefit analysis and only invest your time in things that are going to give you huge wins on goals that are very, very important to you. Cal: So “Deep Work” can be seen as a book about unintentional consequences of new technology in the workplace and what we should do about that. So after that book, one of the more common pieces of feedback I got was from people who were saying, “Okay, maybe I buy this premise about what these tools are doing in the workplace, but what about at our personal life? You know, what’s happening with these digital tools in our personal life? Something is going on here that is distressing.” And I noticed that shift happened over the last couple of years where people went from telling self-deprecating jokes about, oh, I use my phone so much to really being worried and really being upset. They looked at their personal life that they were using these apps and services more than they knew was useful, more than they knew was healthy, and often at the expense of things that they knew were much more important. And for a lot of these people, they actually thought these personal concerns were more important than the professional concerns because they felt as if they’re losing autonomy, if their humanity itself was somehow being degraded by what was going on. And so people wanted a strong response, they had discovered that tips and tricks were not enough, telling people to turn off notifications was not going to solve the problem. People wanted a strong response to, how do I approach technology in my personal life so it’s no longer using me but I’m using it? That’s where the digital minimalism philosophy came from. It’s a philosophy of technology use that basically says start from scratch in your personal life. Throw out all these things that you randomly signed up for and downloaded over the last 10 years, and very intentionally and very selectively, only add back in digital tools that give you huge wins or things you care about and be happy missing out on everything else. It’s a movement, there’s thousands of people out there doing it, and they all seem a lot more happy than the status quo of this constant ad hoc distraction that no one even really remembers signing up for in the first place. Jeff: Yeah. I absolutely love it. I want to encourage our listeners, go to calnewport.com. First of all, Cal Newport’s blog is absolutely amazing. If you’ve not yet read “Deep Work,” I promise you it’s a very approachable book, it’s a book that will rock your world and really get you thinking about the habits that you have formed over time and about how to develop that skill called concentration. But I personally I’m very excited to read “Digital Minimalism.” It’ll be out soon, but if you go to calnewport.com to his blog page, there’s an article called “Why You Should Preorder,” and if you look at that article, you’re going to see a number of bonuses that Cal Newport is offering if you preorder the book. My guess is if you’re listening to this podcast right now, your mind has been rocked here a little bit because we’ve got some work to do. We’ve got some work to do. This didn’t happen overnight. It’s not going to change overnight. It took some effort to get here. It’s going to take some effort to get out of it. But I am very, very encouraged. I want to encourage you to do the same thing. And I just have to say, Cal, a deep and sincere thank you for the work that you are doing. It is much needed by people like me who are just so easily addicted to distraction, much to my chagrin and to the detriment of not just my productivity but ultimately my happiness if I don’t correct it. Studying through “Deep Work” has changed work habits in very significant ways. And I look forward to that journey together. I can’t thank you enough. Cal: Well, I really appreciate the chance coming on and getting to talk to you and your audience. Jeff: Well, I’ll tell you, Murph, just such a great conversation as I knew it would be, and it continues to the journey that I have been on because that concentration piece can be so daunting, can’t it? Paul: It can. You know, like we said before at the beginning of the program, you’ve got to put those things in place to help you be able to concentrate on the work that you want to get focused on. 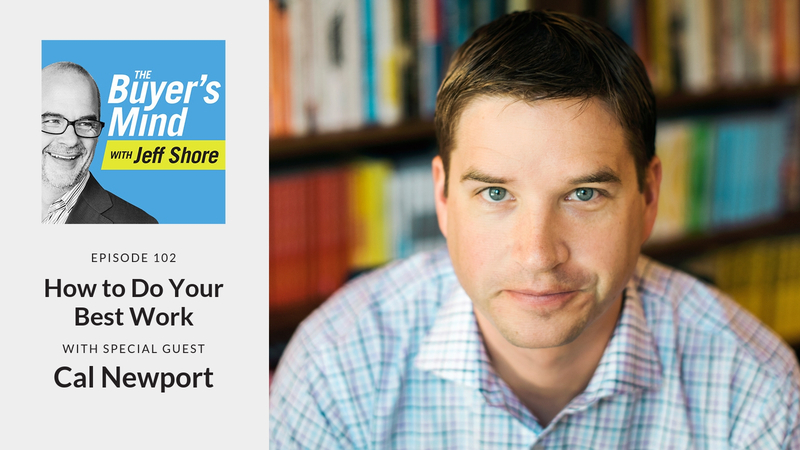 Jeff: I have changed my habits as a result of what I read in “Deep Work.” And in fact, I have a piece of paper that’s taped to the top of my desk with some “Deep Work” habits. It’s blocked out every day the night before, 50% of my time is spent on deep work, no shallow work during deep work time: email, Slack, Facebook, no internet as entertainment, two serious stretching sessions per day so that I can clear my mind a little bit. So just a number of things here that are all as a result of reading “Deep Work” and I want to encourage people who are listening here, as I said, look, I don’t get any royalty if you buy the book but the book was just so powerful for me, I want to encourage you to do the same thing. But there was one thing that we talked about with Cal Newport early on that I want to have you just carry forward as an extension of this conversation. Cal Newport said that effort and time are inefficient metrics of productivity. Effort and time are inefficient metrics of productivity. Now, to me, here’s how I translate that. Don’t confuse effort with results. Don’t confuse effort with results. Just because you are spending time on something and you’re working hard on something does not mean that you are being productive as you can be. If you’re a sales professional, you need heads down time where you’re doing what matters most. And here, we want to talk very specifically on your phone calls. On your prospecting calls, and on your follow up calls, you need to lose the distractions. If there’s an opportunity for you to practice deep work as a sales professional, this is where it is. It’s in looking at your follow up calls, your prospecting calls, so that you can look and you can say, “Well, when I have time today, I’ll make a call here. I’ll make a call there.” I think that’s the wrong way to look at it, frankly. I think you want to look at it by saying, “This is my dedicated deep work time. I’m going to get into the zone. I’m going to turn off emails and text messaging. I’m going to clear my desk. I’m going to close my door. I’m going to make sure that I’m so focused in that I see that target as I’m making my calls that I am so 100% focused that there’s nothing else going on around me.” I really did rework my work after I read the book. I have those lists of work habits taped to the top of my desk. I’m doing a better job of deep work. I want to challenge you to do the same thing. If you want to get to the end of the day, feeling strong, feeling refreshed, feeling encouraged, the way to do that is to dive deep into the things that matter most because once you change your world, you can go out there and change the world of other people as well.